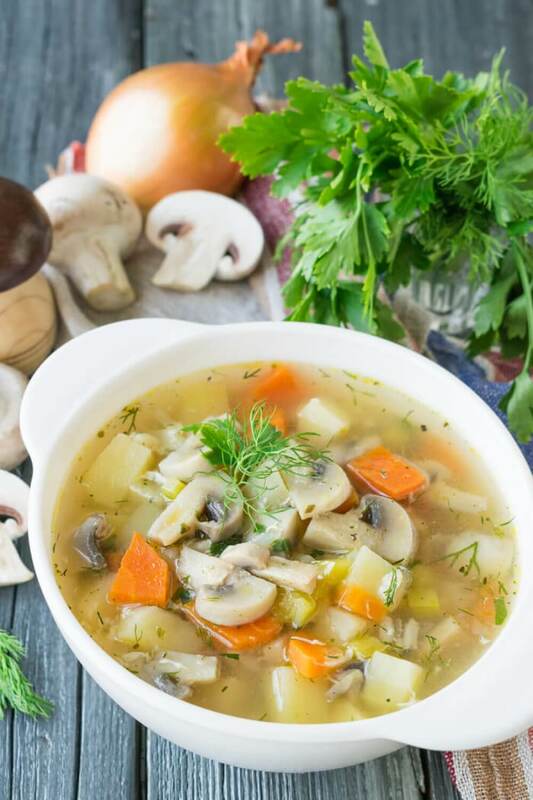 Thick and aromatic mushroom soup will appeal to lovers of rich first courses. 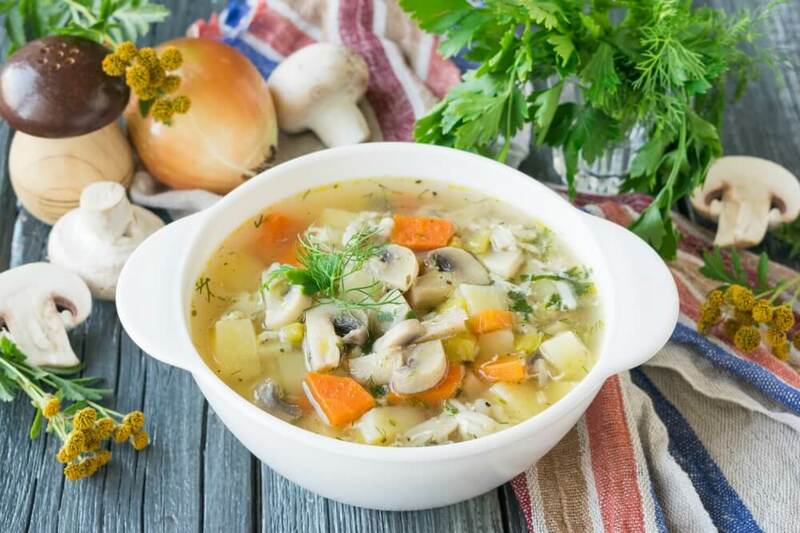 For the recipe, you can use not only champignons, but also oyster mushrooms, as well as fresh, dried or frozen forest mushrooms. 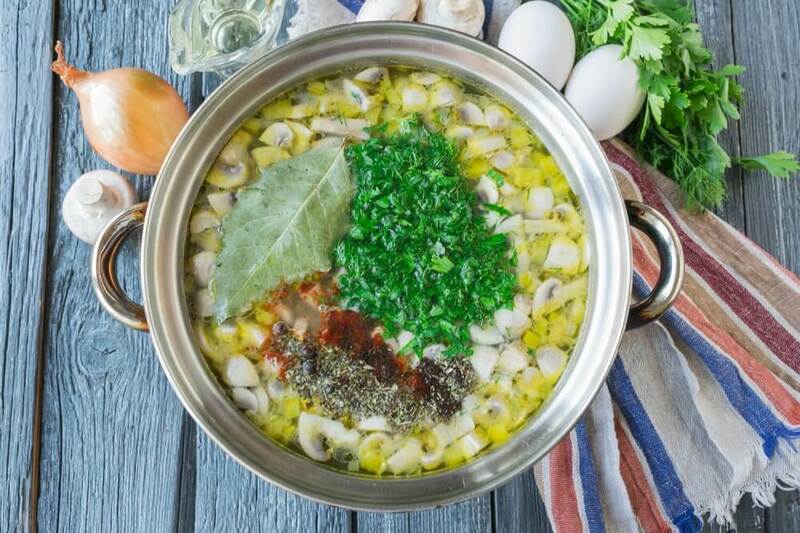 In the post, this soup can be cooked in mushroom broth or water without adding eggs. 1. 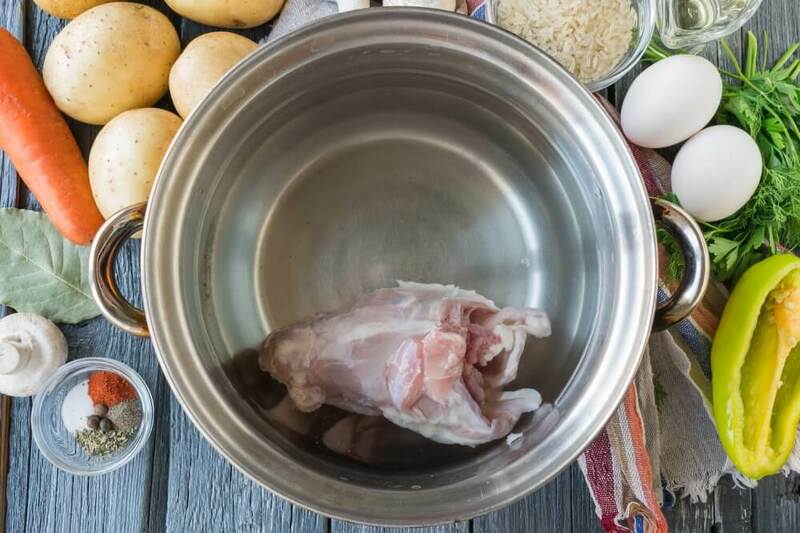 Wash the chicken back, put it in a saucepan and fill with two liters of cold water. Put the pot on the fire and bring to a boil. Remove the foam with skimmer and boil the broth for 30-35 minutes. Then get the chicken out of the prepared broth. 2. 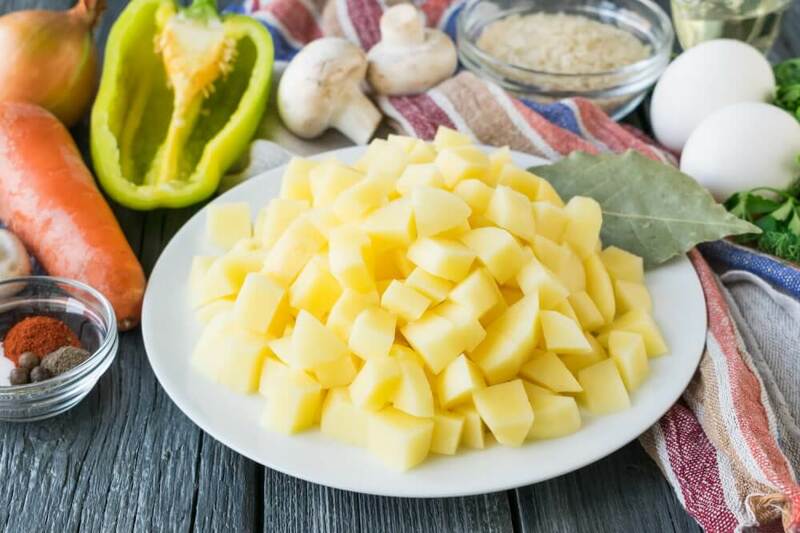 Wash and peel the potatoes, cut the vegetables a medium sized cubes. 3. 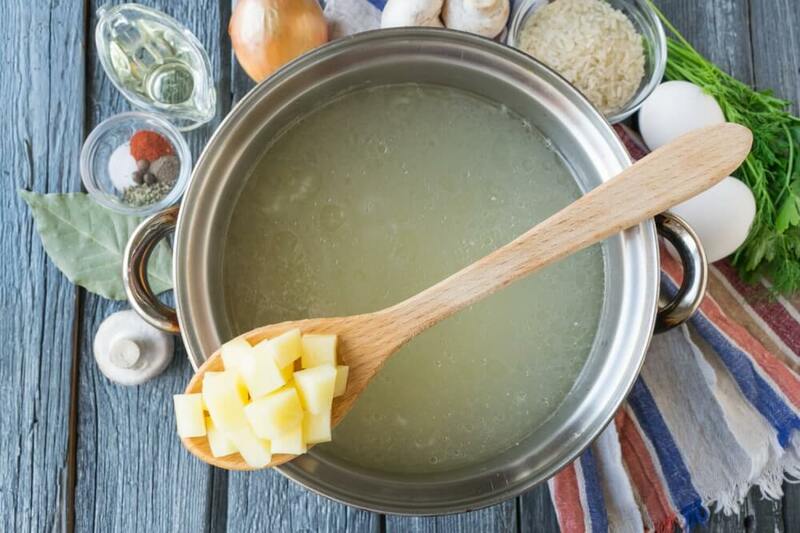 Put chopped potatoes into boiling chicken broth. 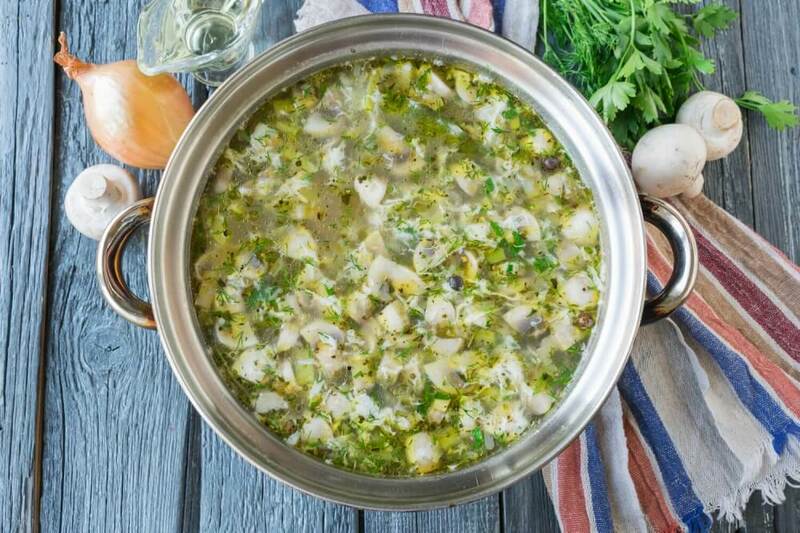 Boil the vegetables for 5-7 minutes. 4. In the meantime, wash and coarsely chop up fresh champignons. 5. 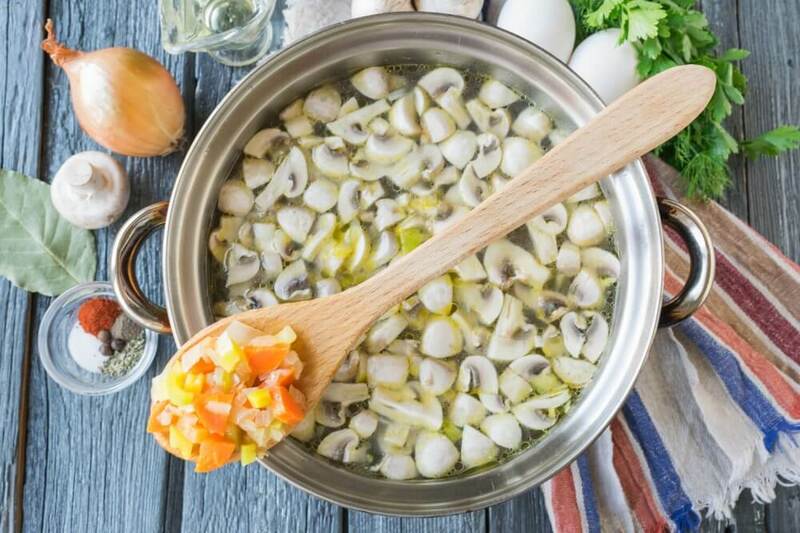 Then add the chopped mushrooms in a saucepan with broth and potatoes. 6. 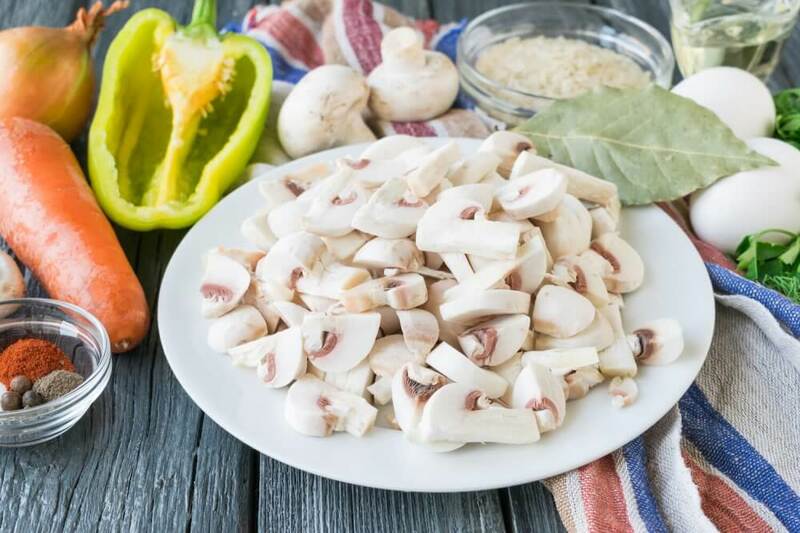 After mushrooms, add the thoroughly washed rice to the soup. 7. Prepare the remaining vegetables. Cut onions and bell pepper cubes, chop carrots into quarters of rings. 8. 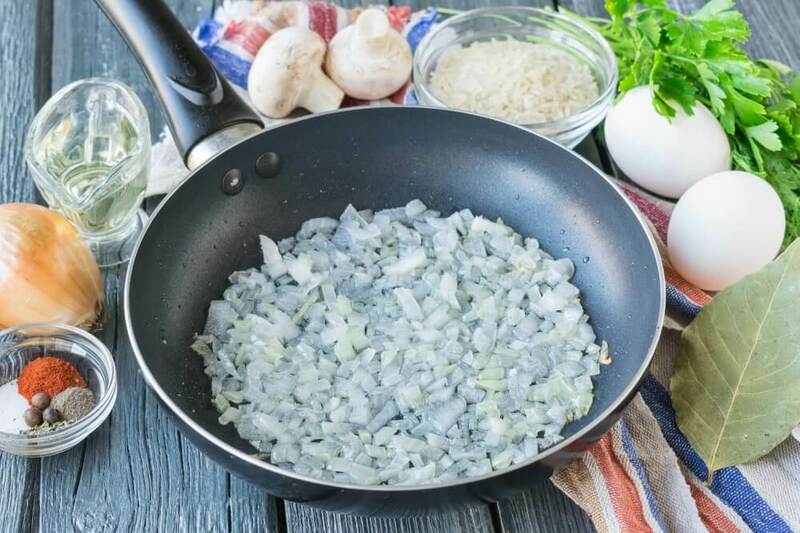 Put cut onions into a frying pan with heated vegetable oil. 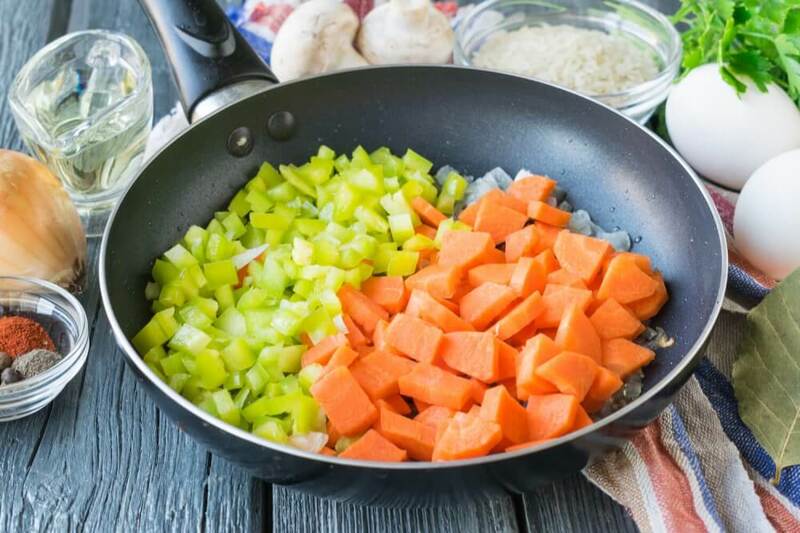 Fry vegetables until soft. 9. Then add chopped bell pepper and carrots to onions. While stirring, pass the vegetables on low heat. 10. 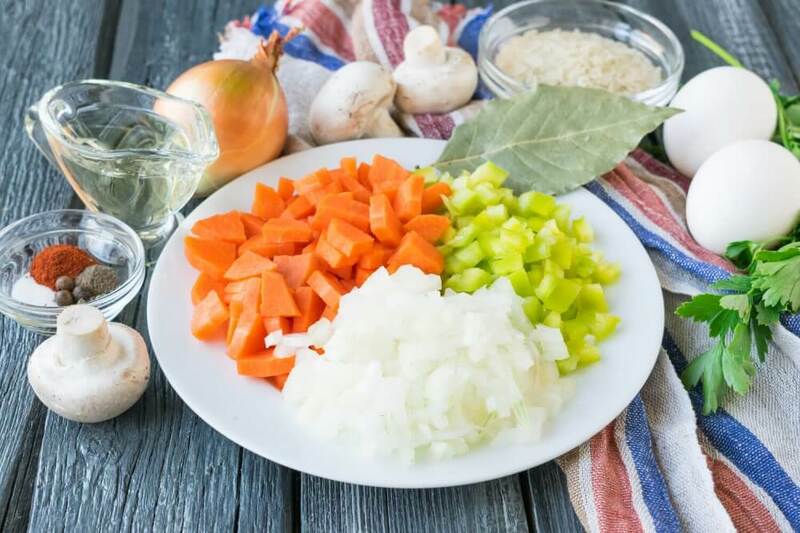 When the vegetables are soft, add them to the pot to the rest of the ingredients. 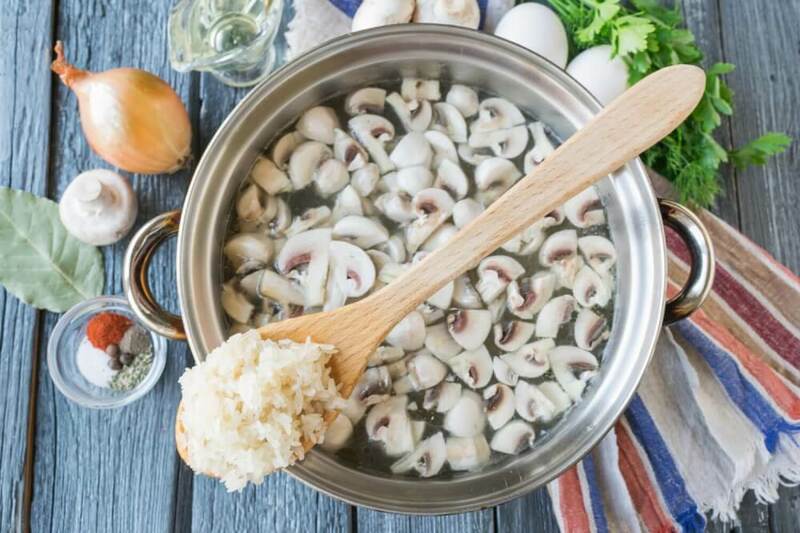 Continue cooking the mushroom soup with rice on low heat until vegetables and cereals are cooked. 11. 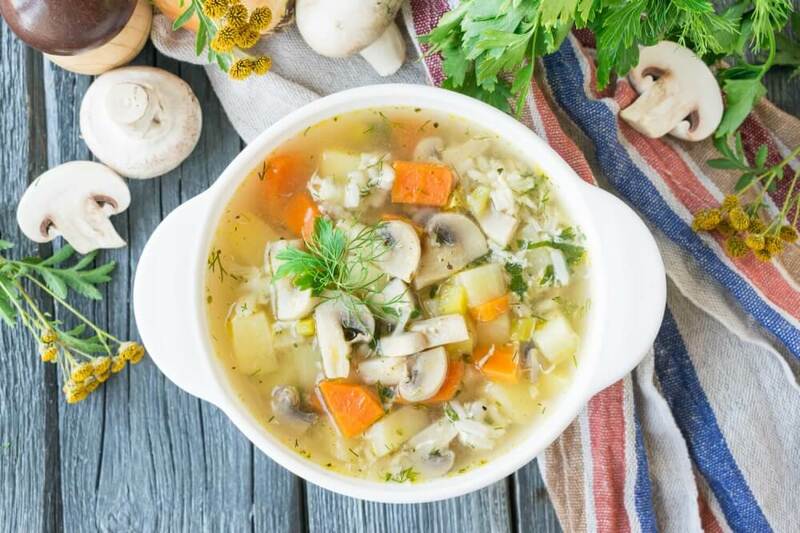 At the end of cooking, add salt, spices and chopped fresh herbs to the mushroom soup. 12. Roll two chicken eggs into a bowl and shake them with a fork so that the yolks and proteins join together. Constantly stirring the soup, pour a beaten eggs into a saucepan in a thin stream. 13. 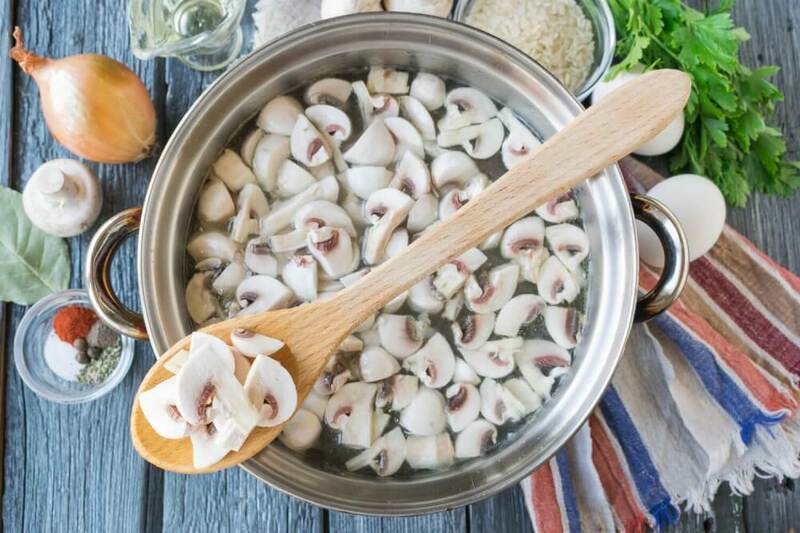 Let the mushroom soup boil, then remove from heat.